If you’ve ever wondered how to make a makiwara, watch my video below where I take you step by step from beginning to end. This was my 5th time making a makiwara and I have learned each time. Pay attention to the details and you’ll avoid the pitfalls. You’ll be up and punching in no time! Well, actually it’s going to take you a few hours… and some considerable effort. However when you’re done you’ll have a traditional makiwara and the satisfaction building it yourself. Enjoy! A little DIY knowledge. It’s a fairly simple process but you have to know how to cut a piece of wood and operate power tools. Disclaimer! If you cut off your own fingers or do something else to cause yourself injury while attempting to build your own makiwara, it’s going to be much more difficult to use it when you’re done. Please be careful. You are responsible for your own actions. If you’re not comfortable and competent with power tools it’s probably best you purchase one online instead. And if you have any questions, comments or suggestions I’d love to hear from you. Please use the comments section below and let me know what you think! As always, stay safe and train hard. Jason: Have purchased both your books and found them very very helpful in adding variety to my classes however (always a however) time, effort, especially cost it would be far better investing in a “Bob” machine, it is life like, moveable, adjustable and can be used effectively with a plethora of different kicks and punches etc. etc. Also found with people using a Makiwara is they don’t retract after the strike. It is essential that you reload your arm in Competition or Street Situation. I teach students to “Train your brain to automatically strike and retract at maximum speed” whether with a punch or kick using drills from your 125 Dynamic Drills Book..Best Wishes. Regarding the makiwara – yes, I agree the time and effort is considerable in making one. I enjoyed doing it over the weekend. Total time from start to finish was about 6 hours when all said and done. That’s including the trip to the store, digging the hole, etc. It actually took far longer to upload and edit the video! Lol. Personally, I love the makiwara. It’s become a great home training tool even though it does have some limitations as you mention. 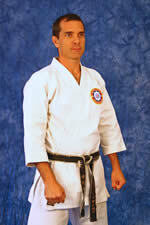 I also have a BOB at the dojo which is also a good training tool. As is a heavy bag, speed ball, etc. I enjoy using all the different training tools and different aspects of technique can be improved from each. As you say it’s important to retract quickly so the energy transfer from fist to target happens quickly, thus giving an impactful strike and not a “pushy” one. Simultaneously one must learn to also penetrate the target and generate forward force, good posture and a solid stance. I’ve found the makiwara is good for developing those aspects. I can also attest to it toughening the knuckles which we don’t get from modern training equipment. As always, thanks for your input Richard. You’ve made some great points for others to consider. I hope you and your dojo are doing well.